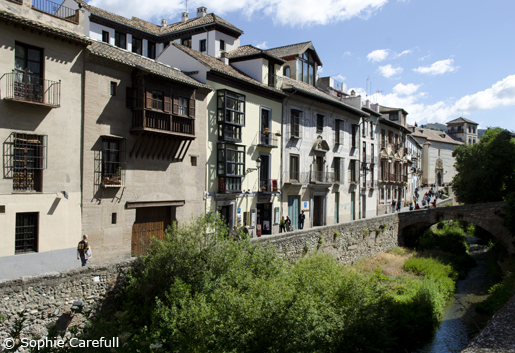 Take one of the most picturesque and romantic walks in Spain, along the Carrera del Darro. Now we are ready to take one of the most picturesque and romantic walks in Spain, along the Carrera del Darro, the cobble-stoned street which over hangs the river and which was once one of Granada´s main arteries, leading to the vanished gate of Guadix and, from there, to the town of that name in northeastern Andalucia. First we pass old Granada´s last remaining arched bridges. These two were built not by the moors, as is often believed but after the conquest, and called Puente de Cabrera and Puente de Espinosa; their original Moorish counterparts downstream were sadly destroyed when the river below Plaza Nueva was covered in the 19th century. You can cross either of these slender footbridges to explore the seedy streets which crawl up the foot of the Alhambra hill, in the quarter known as La Churra, with their faded, elegantly painted façades. The pretty, cobble-stoned Carrera del Darro. Next we see a crumbling tower-like construction on the far bank of the river, with the remaining bit of an arch jutting out above the muddy stream. 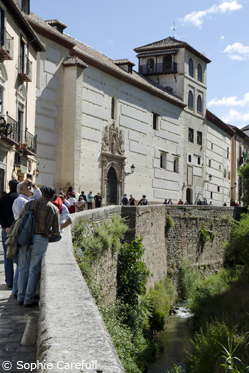 This ``bridge´´ is the centrepiece of one of Granada´s most emblematic scenes, immortalized by 19th century engravers and painters with their craze for ruins, and known as the Puente del Cadi, or ``Bridge of the Minister´´. In the times of the Moors a great city wall encompassed both the old fortress overlooking the right bank of the river, and the newer Alhambra, topped by a road which made it possible to travel directly from one citadel to the other. This wall led down from the Albaicin to a gate (Puerta de los Panderos) which controlled the riverside traffic, spanning both gate and water in a mighty viaduct; from there, a ramp (the remains of which we can still see jutting up among the orchards of the hill) rose up to the main gate of the Alhambra, the Puerta de las Armas (which we can glimpse obliquely if we stand on our tiptoes at the door of the Bañuelo). The ruined tower and bit-of-arch is all that remains of the bridge and its gate, but for those who know it exists there is a sign which gives us a more complete idea of its original appearance. The slots we see in the inner side of the arch were imbedded with bars of the iron grill which kept intruders from entering the citadel by means of the river bed. The bridge was torn down in the 17th century, since the Christians preferred to reach the Alhambra by the more comfortable Cuesta de Gomerez.